Cubby and his mateys are on a hunt for the Golden Dinghy, but Captain Hook steals the map to reach the treasure first! 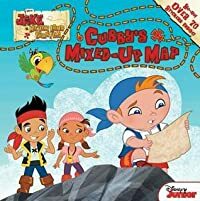 With only his memory and a crayon, can map master Cubby re-draw the treasure map and beat Captain Hook to the Golden Dinghy? Join in the adventure with Jake and the crew in this swashbuckling storybook with two sheets of stickers for even more pirate play!